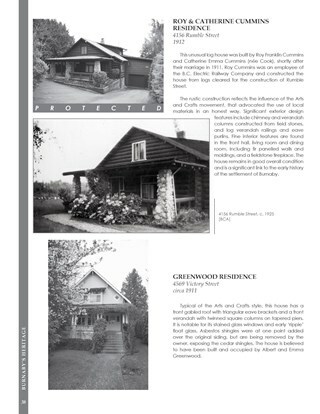 Located on Rumble Street in the Alta Vista neighbourhood, the Roy and Catherine Cummins House is a one and one-half storey, front-gabled rustic Arts and Crafts house, distinguished by the use of log construction and fieldstone verandah columns. The Roy and Catherine Cummins House is valued for its association with the early settlement of Burnaby. Its construction is linked to the opening of the Burnaby Lake Interurban line, which ran through the central part of Burnaby, providing access between Vancouver and New Westminster. The accessibility of the area, combined with spectacular views of the Fraser River, made Alta Vista a desirable Edwardian era middle-class neighbourhood. The house was built in 1912 for Roy Franklin Cummins and his wife, Catherine Emma Cummins (née Cook), shortly after their marriage. Roy Cummins was a lineman with the B.C. Electric Railway Company, an economic driving force in Burnaby. The Roy and Catherine Cummins House is a unique and sophisticated local example of a rustic Arts and Crafts structure. 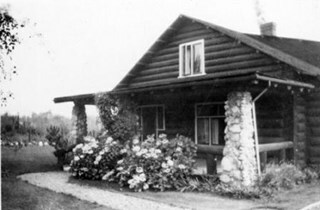 Roy Cummins constructed the house from logs cleared for the construction of Rumble Street; the house is also unique for its use of local fieldstone for its verandah columns and chimney. Reminiscent of park lodge architecture, it exemplifies the semi-wild nature of the area as it was being opened for subdivision. It is also an indication of how far Burnaby was removed from the more urban lifestyles and attitudes of Vancouver and New Westminster. 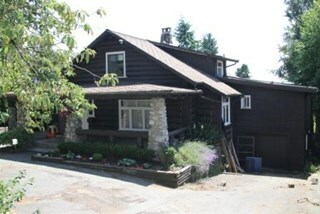 The Roy and Catherine Cummins House is comprised of a single residential lot located at 4156 Rumble Street, Burnaby.